LGBTQ+ folks are constantly being put under a microscope for their gender and sexuality, as many people start to criticize the concept of coming out in a heteronormative society. However, many, including LGBTQ+ people, aren’t so happy with that idea and Grande’s response. Tadhg Larabee from the Harvard Crimson wrote, “Grande’s music video for “‘break up with your girlfriend, i’m bored,’” in which the singer flirts with a man before kissing his girlfriend, gave off serious and uncomfortable Katy Perry “‘I Kissed a Girl’” vibes. And Grande’s choice to headline Manchester Pride as a cis and (apparently) straight artist provoked understandable backlash.” People are viewing this lyric, attached to Grande’s ambiguous tweet response, as something that many other celebrities do: using queerness as a selling point. 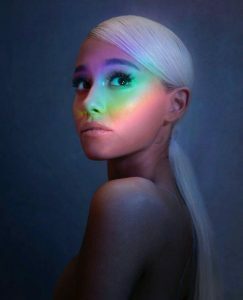 While the refusal to not put a label denies the community of more representation, especially from a beloved star like Grande, the pressure to come out is heightened to a new degree when seen in the public eye. Forcing someone out is harmful and damaging, regardless of whether their name is in the headlines or not. As of right now, let’s keep bopping to Grande’s songs and provide her the space and comfort to share herself as she wants, as we should with all marginalized groups.